I originally wrote this piece in 1990 for Insight Guides Peru, published by APA Publications 1991. It's thrust is similar to the What's a nice country... article that I wrote in 1986. It took a couple of steps back and looked at the bigger picture. I have been reworking the content and adding some perspective from the past 10 years. In 1949 in Ayacucho, a forgotten corner of the Peruvian Central Sierra, several strangers from Lima walked into the workshop of a local craftsman. An impish little man, Don Joaquín Lopéz Antay looked up from his workbench. As an image-maker in a centuries-old tradition, he had often dealt with hacienda owners, judges and other towns people. He repaired their statues of patron saints, refurbished their chapels or made an embellished cross for donation to a church. But these visitors did not behave with the swaggering arrogance of the Creole notables. They chatted amicably about his craft, methods and use of the articles that he fashioned from plaster, wood and glue. These outsiders were artists, writers and academics. They had ventured from the capital into Peru's Andean provinces to uncover what really existed there, establish contact with peasants and traders and break out of the stereotypes prevailing in Lima about Peru's Indian interior. The intellectuals were intrigued by a piece of folk art that the Ayacucho elites rarely noticed. Don Joaquín made a piece called the sanmarkos for peasants. It was a simple wooden box containing miniature saints and livestock. A three-dimensional format with bright colors and Andean motifs, it served as the centerpiece in the magical religious branding rites in a traditional pastoral society. Its roots lay in the small portable shrines brought to Peru by the conquistadores as part of their evangelization mission. With time, the peasants assumed this artifact as part of their own universe, combining the Christian God and his saints with Andean spirits. The Lima visitors were impressed by the expressive potential of the form and wanted to commission something different. They asked him to break out of the strictures of the branding ceremony and use the figures to portray his own universe. Scratching the stubble on his chin, Don Joaquín set aside his May crosses, saints and sanmarkos. He transformed the format and content. He introduced the ebb and flow of life -- the drunken fiestas in the streets, the bustle of the markets and the repression of the crowded jails. Other scenes showed the Nativity and Easter processions. The Lima intellectuals called this new creation a retablo, meaning altarpiece. A new strain of folk art had been invented, one that would be taken up in textiles, ceramics and painting. This chance encounter between the traditional Andean world and the modernizing influences of the 20th century was repeated up and down the Andes, in Cusco, Puno, Huancayo, Cajamarca, and even in Lima, over five decades. Some of these encounters resulted in new folk art forms, music and tales. Other encounters yielded new forms of organization, the demand for education and excursions into the alien coast through migration to gain a place in urban society. Each of these encounters was unique in the forging of Peruvian identity, of suffering and destruction, of joy and celebration. 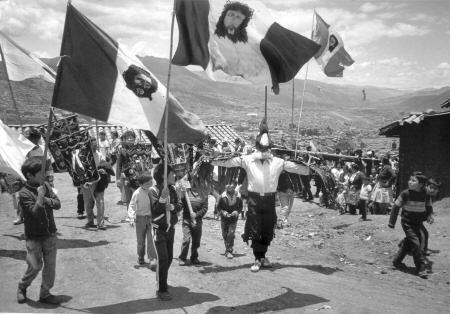 Against the the backdrop of the valley and city of Cusco, a procession mixes Inca, Christian and modern symbols. What is striking about this process is that the Andean realm drew on its traditions of cultural resistance against oppressive dominance. It avoided wholesale absorption into dominant white European society, but created new ways of inserting itself into a broader world. Resistance and renewal, change and continuity are constants in Peruvian society. They became synonymous with modernization and breaking out of a rigid, backward, semi-feudal society. At first sight, Peruvian society may seem brutally divided. On one side, white creoles trace their bloodline back to the Spanish Conquest in 1536. Like the generations before them, most live in Lima -- the old colonial capital that still boasts a statue of Pizarro in its main square. They are products of industrialization, urbanization and the Age of Computers. And for cultural inspiration, their eyes are firmly fixed on Miami: every aspect of North American mass culture, from Nike running shoes to Disneyland and New Kids on the Block, is part of their children's upbringing. On the other side, according to this view, are the Andean Indians, subjected during the Spanish Conquest, yet heirs of an awe-inspiring pre-Columbian culture. Theirs can seem an archaic society, locked in a time warp: lost in their impoverished mountain villages, they still speak their ancient tongue and listen to their haunting, melancholy music played on traditional wooden Pan's pipes. But Peruvian society is a much more complex multicultural mixture. While it may be possible to pick out two extreme poles of cultural identity, there are many places for Peruvians to fit in between. The Peruvian Indian cultures are a complex mix. The Andes has two large ethnic groups; one speaks Quechua, the language of the Inca Empire; the other speaks Ayamara and it settled around Lake Titicaca and the neighboring Bolivia. (In fact, the Aymara people easily slip back and forth across the border to engage in commerce.) Even among the Quechua speakers, an Indian from Huancayo may not be able to make himself understood to an Indian from Cusco because of regional differences in the dialects. Beyond these global distinctions, there are other complexities that slip in. There are "white"ethnic groups, like the Morocuchos of Pampa Cangallo (Ayacucho) who have light colored eyes and hair, speak Quechua and feel campesino. According to legend, the Morocuchos are the descendants of a renegade band of conquistadores who held out in an isolated stretch of the Sierra. In other regions, like Cajamarca, peasants have lost their language and racial features but still think and act like peasants and feed bound to the earth. The misti, the dominant class in the Andes, may speak Quechua, share cultural traits and have Indian or mestizo (mixed blood) physiological characteristics, but he falls on the other side of the race-class divide. Meanwhile, in the Amazon jungle, there are 53 ethnolinguistic groups.